This is the second Haven Point story I've read. Evergreen Springs's heroine is a lady doctor and the sister of the previous story's leading lady. When Devin Shaw becomes the de facto physician for an old friend in her third trimester, she ends up linked to the extended family. This includes the handsome yet trouble horse trainer and his two children. Each has troubles in the past to overcome in order to make a Merry Christmas with each other. 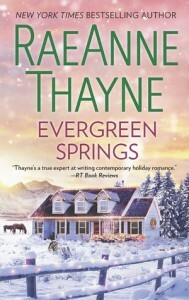 Evergreen Springs is a lovely, sweet romance with many elements I likes in a small town romance - smart leads, solid backdrop of community, and a believable build up in the romance. If you like the small town romance you could like this series.